“My first experiences in the faith, my first experiences in the sacraments were all here and that had a huge impact,” Fr. Michael Liliedahl remembered when looking back on how growing up in Juneau helped spark his vocation journey. Fr. 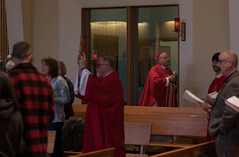 Michael Liliedahl was ordained a priest June 10 in the Archdiocese of San Francisco and a week later he celebrated Mass twice in his hometown, at the Cathedral of the Nativity of the Blessed Virgin Mary and the National Shrine of St. Therese. Fr. Michael shared how his experiences as a parishioner at the Cathedral helped him find his calling. One of the first memories he recalled was during a Holy Thursday Mass celebrated by then Bishop, Michael Warfel. At the Mass Fr. Liliedahl was selected to represent the High School youth group for the washing of the feet. It was that exchange during Holy Week that set things in motion for Fr. Liliedahl to explore the priesthood. Another major influence came from the Cathedral’s rector, who at that time was Fr. Peter Gorges. “He was the priest for my first Communion, he heard my first Confession, and taught me how to altar serve,” Fr. Liliedahl said. Though he went to seminary right out of high school, he admitted that at 18 years old he wasn’t ready and left so he could have a “normal” college experience. This led him to meet with his parish priest in San Francisco. The priest gave Fr. Liliedahl a prayer to meditate on “In Your will oh God, is my peace” and it was in this prayer that he decided to pursue his vocation. He admits that not everything came together at once, but after entering seminary again he felt like his work and life had meaning. Eight days after his ordination, Fr. 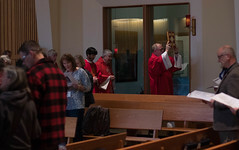 Liliedahl said that he still hasn’t processed the experience, but shared that it was “Incredible to be welcomed into the fraternity of the priesthood there (in San Francisco) and to see everyone’s excitement” the day of his ordination. He said he was grateful for his parents’ and siblings’ support through the whole process and their encouragement to pursue the call.